"When He, the Spirit of Truth (Sathya) comes, He will guide you into all Truth... and He will declare to you and show you the things that are to come. He will glorify Me for He will receive of Mine and declare it, show it to you. All that the Father has is Mine; therefore, I said that He will take of what is Mine and declare it, show it to you." (John 16:13-15). 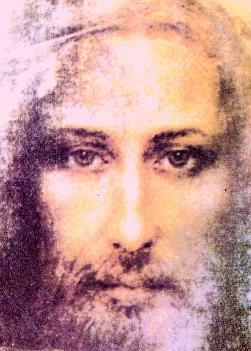 "Jesus' original Name was Isa which, when repeated, is Sai. Isa and Sai, both mean Isvara, God, the Eternal Absolute, the Sath-Chith-Ananda (Being-Consciousness-Bliss). In the Tibetan manuscript at the monastery where Isa spent some years, His Name is written as 'Issa', which means: 'the Lord of all living beings.'" We should note that "Isa" is the Muslim name for Jesus, also. Sathya Sai Baba has explained the meaning of His Name thus: "Sathya" means "Truth" or "True", "Sa" means "Divine" and "All". "Ai" or "Ayi" means "Mother". Hence "Sai " means "the Divine or Supreme Mother of all. " "Sa" also means "Self-realization and visulization of the Lord - the highest stage of 'samadhi' and sadhana or spirtual practice." "Aayi" means "Master" and "Baba" means "Father." Thus "Sathya Sai Baba" mens: "the True Divine Mother/Father of all, the Goal of all yogic or spiritual endeavor, the ever-merciful Mother, the all-wise Father and the Goal of sadhna." And, as per the Buddhist prophecy, spiritual people have indeed been drawn to this "Word of Truth." In the Book of Revelations in The Bible, the Lord appears in His bloodred robe, His Name again being "True" - "Sathya". On His Robe, on the thigh area, "He has a Name inscribed which no one knows but Himself." (Rev. 19:12) We should remember that when Sathyanarayana announced Himself as "Sai Baba", no one in his village of Puttaparthi even knew who "Sai Baba" was! In addition, the name "Sai" is not a common Indian name; in fact, its origin is obscure, Professor N. Kasturi saying that it may be a derivative of the Persian word "Shah", meaning "King or Monarch". Hence Sathya Sai Baba has had to explain the meaning of this Name "which no one knows but Himself." Further, Sathya Sai Baba does indeed have a blood-red robe with His Name inscribed - embroidered or woven - in large gold letters on the side, the thigh area, of the robe, the robe itself having been a gift from a Hindu devotee who know nothing about the Christian prophecy whatsoever! Astral image, taken at Jerusalem, close to the Wailing Wall (said to be one of the most powerful energetic locations on the planet), by a Spanish tourist. He had the strong wish to see Jesus and His disciples how He walked the Holy Land 2000 years ago, so His mind set the focus to capture the Akasha Chronicle on the film material (it was a colour film). 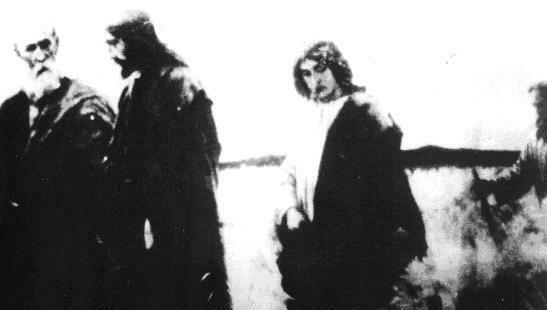 According to an unconfirmed source, the photo is showing Luke, Jesus, John, Bartholomaeus on a walk, probably exactly at the place the photo was shot. Truly speaking, Christmas falls in the month of March, not in December: Since it is very cold in December and people are confined to their homes, they use this time to celebrate Christmas [the true birth date of Jesus was commonly known until the Christian Church incorporated a pagan festival out of political reasons. P.M.]. Actually Jesus was born in the month of March. With the passage of time, this fact has been distorted and misrepresented in the Bible. "Munde munde Mathir Bhinnah" (Heads vary so also thoughts). Each one interpreted Bible in his own way. Some wrote that Jesus was never born. Some wrote that it was the brother of Jesus crucified, not Jesus and that He was in Japan at that time. This is all imagination. Jesus is Truth. When Jesus was a small boy His parents took Him to Jerusalem to attend a fair. After some time, Mother Mary not finding her son Jesus by her side, believed that He had lost His way in the crowd and searched for Him frantically. Ultimately she found Him listening with rapt attention to the sermon of the priest in the temple. That scene reminded her of the prophetic words of one of the Arabian kings who visited Jesus at the time of His birth that He would love God. She hugged her son and shed tears of joy. Jesus said, "Mother, you can find me in the company of God, but you have been searching for Me elsewhere. I consider divine proximity as My greatest wealth." Saturnalia was a popular festival for the Roman Legions and in fact emperor Aurelian in 274 made it an official holiday for the entire empire. By the year 336 AD the Church in Rome was having problems with the Saturnelia cult. People had parties from December 17th all the way through to the New Year. The Church decided to make the Christ Mass or the Festival of Christ on the 25th. That would ostensibly break up the pagan two week period of revilries. The idea of gift exchanges by the way comes from the Saturnalia cult.